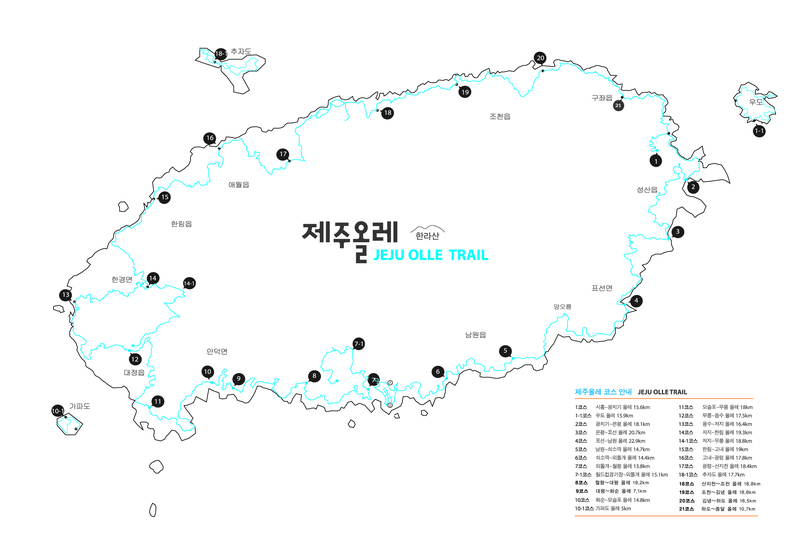 Trail Markers Lead the Way by Lee Seong-gwan along Route 2 on March 3. We had 17 people finish the Route 7-1 walk. Sunrise was at 6:54 a.m. and sunset will be at 6:36 p.m.
We have a high of 13°C with clear sky due all day. A light air ( 1m/s) rare for Jeju!) will become at light breeze (2-3 m/s) later blowing south-west then south. Watch out for the rain arriving on Saturday evening. Breathe easy and deep. It’s clean and fresh. Through the Stones on Route 14-1 during a guided walk on March 4. By Kang Jon-cheol. Guide Kim Tae-su led walkers on Route 5. Sunrise was at 6:57 a.m. and sunset will be at 6:34 p.m.
We have a high of 12°C with continues rain in the morning followed by cloud in the afternoon. A moderate wind (6 m/s) is going to blow south-west. Prepare an umbrella or rain coat for the next few hours at least. By mid-morning the air quality should be cleaning up nicely. However, some mirco-fine dust will be left over for today. Expect better levels from tomorrow.